It’s been a while since Toyota has been able to compete in the compact estate market. Indeed, not since the Corolla, which was discontinued back in 2007, has it attempted to compete with the likes of Ford, Kia and Skoda in the highly competitive market of compact wagons. However, with its Auris Touring Sports, Toyota is claiming to have made up ground and produced a car that’s as practical as it is economical. With a title as evocative as ‘Touring Sports’, you’d be forgiven for confusing Toyota’s new addition with something that’s far more glamorous. In reality this could not be further from the truth. 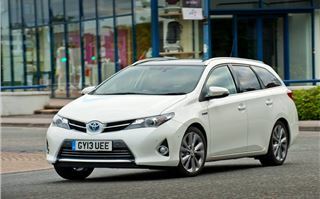 Toyota believes the Auris Touring Sports will define itself as a cost-effective champion, with a combination of a class leading load bay and an impressive range of fuel efficient petrol, diesel and hybrid engines. Based on the Auris hatchback, the Touring Sports’ wheelbase and front are effectively unchanged from the hatchback, however, to boost the Auris’ size, Toyota has stretched the body by 285mm and increased the storage capacity to 530 litres. Grounding its estate on the Auris has worked extremely well in regards to the car’s exterior. For us, the Touring Sports is one of the sleekest and most stylish compact estates on the market. To improve the car’s centre of gravity, Toyota has reduced the car’s height by 55mm, while also lowering ground clearance by 10mm, which adds to the car’s visual appeal. There are four trims to choose from: Active, Icon, Sport and Excel. Active is the basic level and comes well equipped, with hill-start assist, roof rails and LED daytime running lights fitted as standard. As you would imagine, things get slowly more luxurious as you go up the range and Excel will get you 17-inch alloy wheels, rear privacy glass and cruise control. Swing open the door to the boot and you’ll discover a well-crafted load bay, with a lip that measures 100mm lower than the hatchback. The storage area is flanked by useful wall boxes, which can carry small or loose items. The load area is also well protected, with tough plastics and durable carpets. If 530 litres isn’t enough storage for your needs then the 60/40 split-folding rear seats can be pressed down with a simple pull of a seat mounted lever to increase the load area to around two meters and 1658 litres. With that amount of space the Auris quickly becomes cavernous and practical, swallowing up whatever you push its way. It is also considerably bigger when compared to some of its rivals, providing more storage than both the Ford Focus Estate and Kia Ceed Sportswagon. Our only bone of contention is the fact that the rear seats do not fold flat, which raises problems when trying to slide large objects into the car. Interior quality is generally good, if somewhat drab, and everything feels well made and securely fastened. The dashboard layout is scattergun in its approach, with buttons and levers positioned in all manner of places, but the inclusion of steering wheel controls serve to nullify most of these issues. From a driver’s perspective the Auris is comfortable, with excellent visibility levels, both at the front and back. The engine line-up is varied too and includes 1.33 and 1.6-litre petrol engines and a 1.4-diesel unit. There’s also a 1.8-litre petrol-electric hybrid. 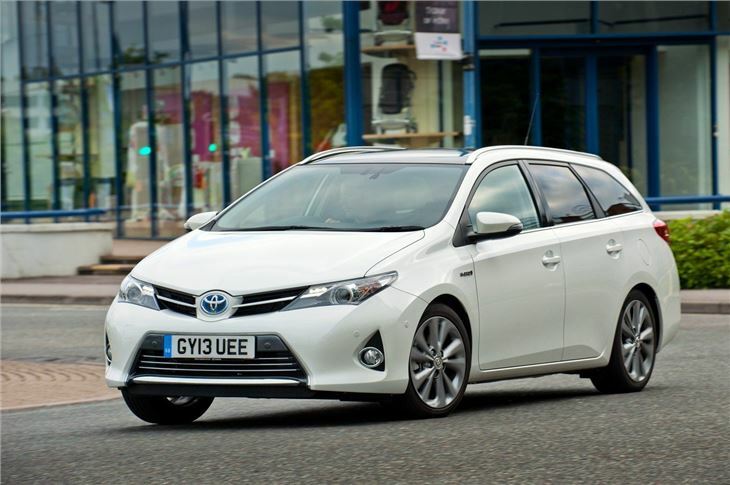 Toyota believes that the hybrid will make up half of all sales of the Auris Touring Sports, with roughly half of those going to fleet buyers. The 1.8-litre VVT-i petrol engine and electric motor is identical to the one used in the Prius and generates 141PS/100kW, which allows the Auris to trundle along from 0-62mph in 11 seconds before eventually reaching a top speed of 109mph. On paper, the hybrid is clearly the most tempting configuration, with 85g/km CO2 emission levels and an average fuel economy of just 76mpg. However, in reality, the hybrid disappoints with slow and noisy performance. During our test we ‘filled’ the Auris Touring Sports with just two adults and one satchel, yet even with this minor load the car felt lethargic and strained in hilly conditions. The Auris’ modest 142Nm is further hindered by the continuously variable transmission (CVT), which forces the engine to work at high revs and emit a noise that can only be described as loud and grating. The only other powertrain available at the car’s launch was the 1.6-litre petrol, with 160Nm of torque at 4400rpm. However, even with the extra horses, and a manual six speed ‘box, the Auris is still woefully underpowered. It’s a real shame, because the overall ride of the car is generally good, with responsive road handling and hushed wind noise. But, being an estate, the ability to glide through corners and soak up bumps is all but rendered useless when you factor in its inability to provide ample transport for a family and its cargo. Of the entire engine line up, the 1.4 diesel looks the most promising, offering 205Nm and 67mpg, however, we’ll have to wait before we can verify its performance. On paper, at least, it looks like it might make the best of the estate’s weight and dimensions. Prices for the Toyota Auris Touring Sports start at £15,595 for the 1.33-litre petrol and £16,945 for the 1.4 diesel, but you’ll be looking at £21,095 for an entry level 1.8 hybrid. The estate market is highly competitive at the moment and the combination of poor performance noisy transmissions make it extremely difficult to recommend the Auris Touring Sports. For this money, we’d look elsewhere.